The nice thing about this site is it bases its statements on research and rates the strength of the research that backs the statements. There’s very little you haven’t already heard, but it seems people are still making the same mistakes after all these years. Planning – Have an idea of what you are aiming for before you start. If you take a random approach to design and development you will get a random result. Make group decisions on the look and feel. Relying on one persons opinion will reduce the chances of have a site with mass appeal. Colours – Basic colour schemes rule. Black text on a white background may seem boring, but it’s easy to read, which is why just about every publication you will see uses it. Navigation – It should be simple and consistent. People need to understand where they are and where they came from! Layout – Use page layouts that are appealing to the eye. Jumbled pages don’t scan well and are generally very annoying. By default the plugins are ordered alphabetically, which can be annoying. This extension allows you for order them any way you want. It also allows you to delete them easily, which is quite handy as different versions of Firefox store the plugins in different locations. They’re pretty simple to create, so if you want to make some of your own, follow the Mozilla-Search Plugin Documentation. The first person I bumped into was Tom Kyte. I didn’t get to speak with him at the bloggers dinner, so it was cool to hook up and have a quick chat. I got to speak to Peter Scott and Mark Rittman again, which was cool. Whilst walking around the exhibition I noticed the Net 2000 Ltd stand. A few years ago I received an email asking me to add DataBee to the tools page of my website. At the time it was the only product they had and it was free. It also came at a time when I was trying to get referentially intact subsets of data. Bingo! Since then they’ve created DDL Wizard for extracting DDL from export files and Data Masker for sanitizing production data for use in test and development environments. I spoke to Dale Edgar at the stand and he gave me a demo of the DDL Wizard. It’s pretty cool and the real bonus is that it’s free 🙂 The thing I like about this company is that they have specific tools for specific jobs. They’re not throwing out the one-size-fits-all type of stuff that everyone else is doing. Nice ideas, well executed products. I hope they continue to do well and keep coming up with good ideas. I’ve also just noticed that they are based in Bromsgrove, just down the road from me. The Quest stand was very slick, and they were giving away some cool freebies, but I didn’t get hold of any 🙁 I was interested to see the new Spotlight on RAC stuff. I nearly bought Spotlight recently, but backed out when I found that alot of the graphs and alerts had not been revised to recognize the renamed wait states in 10g. Not very useful to have a performance monitoring tool that says everything is OK when it’s actually falling apart. This has been rectified in the latest version and the RAC stuff looks really nice. I think I may have to re-demo it. Guess what happens when you hang around with a bunch of Oracle geeks? 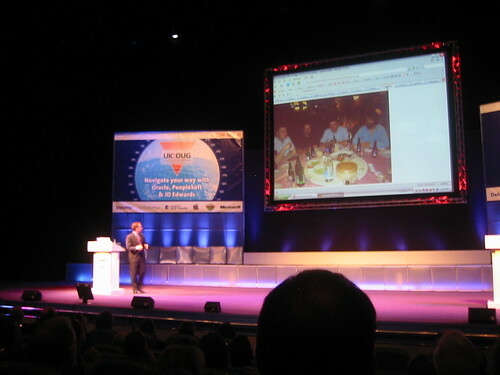 You become part of Tom Kyte’s keynote speach at UKOUG. I’m the one on the left with the chopsticks. Hopefully this will lead to my first movie roles as, “guy with chopsticks on the left of the action”. You can but hope 🙂 This picture is from Mark Rittman‘s blog. I went out last night to see two of my friends (Jodie and Mel) who sing backing vocals in a Meat Loaf tribute band called “Maet Loaf” (pronounced “mate” with a black country accent). I’m not a Meat Loaf fan so I thought I wouldn’t know any of the stuff, but I ended singing along to every track. It’s pretty scary how much stuff gets into your head without you knowing it. I guess that’s how advertising works! They were brilliant. The lead singer is awsome. When he sings he sounds just like the records. It wouldn’t surprise me if this guy sounds more like Meat Loaf than Meat Loaf himself, if you know what I mean. The girls did a great job, as did the rest of the band. The whole night went down really well.